We’ve all come across a jello shot at some point in our lives (see: college), those wiggly party treats made with the cheapest liquor you can find. But jello shots—or jello jigglers if you prefer—have come a long way. We promise, they are more than a cheap party shooter. They can actually be fancy and sophisticated. It’s simply a matter of making the most out of your ingredients. Never had jello shots? They’re exactly what they sound like: an individually portioned size bite of jello, traditionally consumed as a shot. And they’re great with or without booze. Use water or juice if you’re making booze-free, or replace the liquid with alcohol if you want an adults-only version. Vegetarians and vegans, don’t worry, there’s a jello shot option for you too. Regular gelatin is traditionally made with collagen, but substitutions can be made with agar agar (cooked and pressed algae, used in a lot of Asian cooking) or carrageenan (dried seaweed). Because these differ, both in texture and how they are prepared, you may have to do a little testing until you reach the right consistency. And that’s the beauty of jello shots; they’re incredibly easy to customize and there’s no wrong way to make them! Flavors, colors, shapes, whatever you can imagine, you can make. Feeling the fall vibes? Make pumpkin-flavored jello jigglers. Or get into the Christmas spirit with red and green jello shots. There’s literally nothing you can’t do and there’s never a wrong time to make jello shots. Birthday? Definitely. Halloween? Of course. Bachelorette? Hard yes. For the most basic, easiest, and fastest shots, we’ll walk you through how to make jello shots and what you’ll need to make ‘em great! Note: this recipe will yield about a dozen shots depending on how full you fill your cups. Step 1: Pour the jello powder in the liquid measuring cup. Add 1 cup of boiling water and stir until all of the powder has completely dissolved. Step 2: Add 1 cup of cold alcohol and stir until combined. Step 3: Pour the mixture into mini plastic cups and chill in the fridge for two or more hours until set. Although jello shots can be made with any type of alcohol, vodka is the most common. You can use any brand or flavor that you’d like. To make a basic jello shot with vodka, just follow the how-to above and use vodka for the cup of chilled alcohol. 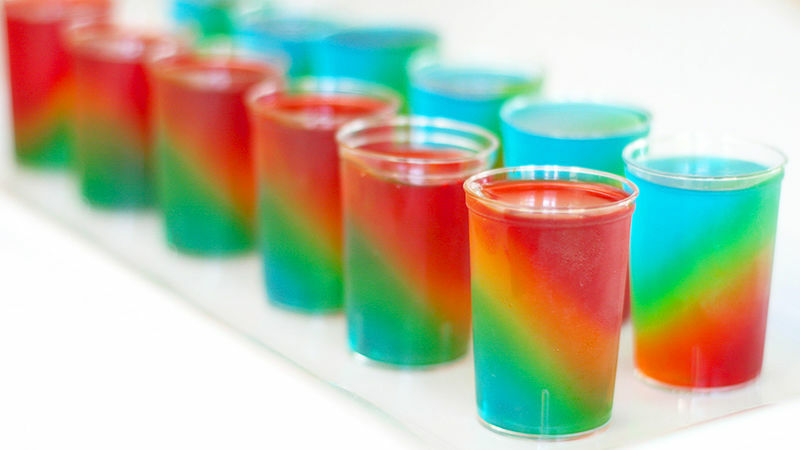 If you want to take things up a notch, try our recipe for Rainbow Jello Shots using vodka and all kinds of jello flavors! If you’re not a fan of vodka, you can also learn how to make jello shots with rum. Again, you can follow our basic recipe above and use chilled rum for the cold alcohol. We recommend using clear rum like we did with our Strawberry Daiquiri Jello Shot recipe. Love margaritas? Can’t imagine a party without tequila shots? Good news! You can learn how to make jello shots with tequila, too! Again, following the basic recipe that calls for a cup of cold alcohol, simply use clear-colored tequila. We probably don’t have to tell you that cheap tequila isn’t the best choice to use for jello shots. If you’re a tequila fan, you likely have a tequila preference, but we recommend Jose Cuervo or Patron for the party. Want that layered look? The secret is time and patience. Each layer will need enough time to set in order to get those clean lines. It’s a good idea to make layered jello shots the day before the party, so each layer has enough time to set. You’ll also want to choose a different color of jello for each layer, obviously. To make the layers, you’ll use the same amounts of liquid and jello powder for each layer. After you’ve poured a layer, you’ll need to put it in the fridge until the jello layer has set. We recommend at least 30 minutes between layers. Then you’ll pour the next layer and repeat the process. When all of the layers have been added, you’ll want to let the entire dish set in the fridge for at least two hours. Try to make layered jello shots with our festive recipe for Holly Jolly Jello Shots. Watch the video and see how easy it is! If you choose to forgo the boxed flavored powder mixes and create your own from scratch then there’s a little more science involved. Whatever form of “gelatin” you choose, you need to know its “bloom” rating, or strength. The weaker the gelatin, the lower the bloom rate. For example, common grocery store brand Knox gelatin has a strong bloom. The stronger the gelatin, the firmer the shot; a good thing to keep in mind if you’re cutting your shots into cubes to be eaten with fingers or simply pouring them into individual shooter cups. Another key to great jello shots is starting with boiling water, which will help activate and properly dissolve the gelatin powder so it can set and firm up later. From there, the mixture of liquids is up to you. While not required, if you’re making boozy shots, you can pre-chill your alcohol before adding it to the mix. Since water boils at 212° F and alcohol boils at 173° F, using cold alcohol ensures that none of the alcohol will evaporate when adding it to the boiled water and gelatin. Obviously the ratio of liquid to gelatin powder will affect the taste of your shot. More alcohol will result in a stronger alcohol taste and more potent shot. Add more water and the more watered-down the shots become. Alcohol proof will also affect the texture and taste of your shots. Go ahead and test out different combinations until you get your preferred taste and texture, it will be totally worth it (plus you can eat the rejects). If you need help getting started, Tablespoon has plenty of jello shot tips and jello shot recipes already tested and verified tasty! There are so many types of jello shots out there, it’s hard to know where to begin! Once you’ve got the basics down, it’s time to get creative with flavors, shapes and colors. Think seasonally, like pink lemonade for summer or apple cider for fall. You can also try out different color combinations like your favorite team colors for game day. And don’t feel confined to just shot cups. Use molds for fun shapes like these banana jello shots, or fill hollowed-out citrus peels and slice into fruit slices like we did with these jello shots in orange wedges. Just make sure to spray any molds or containers you’ll be using with a thin layer of cooking spray. It’ll make dislodging the shots much easier and it won’t affect the taste! If your shots are on the softer side, serve them in pliable plastic cups or little shot glasses with something to dislodge the shot like a cocktail straw or mini spoon. Firmer shots can be made in one large pan and sliced into bite-sized squares. We know—this is a lot of information on how to make jello shots and it can be overwhelming to figure out which type of jello shot you should make for your party. Keep calm. We’ll answer all of your jello shot questions right here so you can troubleshoot on the fly! How Long for Jello Shots to Set? If you’re wondering how long it will take for your jello shots to set, it depends on which type you make, but a general rule is two to four hours. A basic jello shot recipe should be allowed to set in the fridge for at least two hours. Four hours is better. If you’re making layered jello shots, you will have to allow each individual layer to set for about 30 minutes before adding the next layer. Then allow the entire dish set for at least two hours. You do not want to freeze jello shots. You can speed up the set time by placing it in the freezer, but you’ll have to keep checking them to make sure they don’t freeze. Jello shots can last in the fridge for up to three to five days, so you can still make them in advance of the party without having to freeze them! How do you Store Jello Shots? People often ask “how do you store jello shots”. To store jello shots, place them in a container with a lid and keep them in the refrigerator. They will always taste best if you eat/drink them within a few days but they can last for a few days. Jello shots last in the refrigerator for three to five days. They can last even longer than that, but if you want them at their best, you should consume them within a couple days of making them. Now that you’ve got the pro-tips, time to put them together and make a batch of jello shots for your next party!